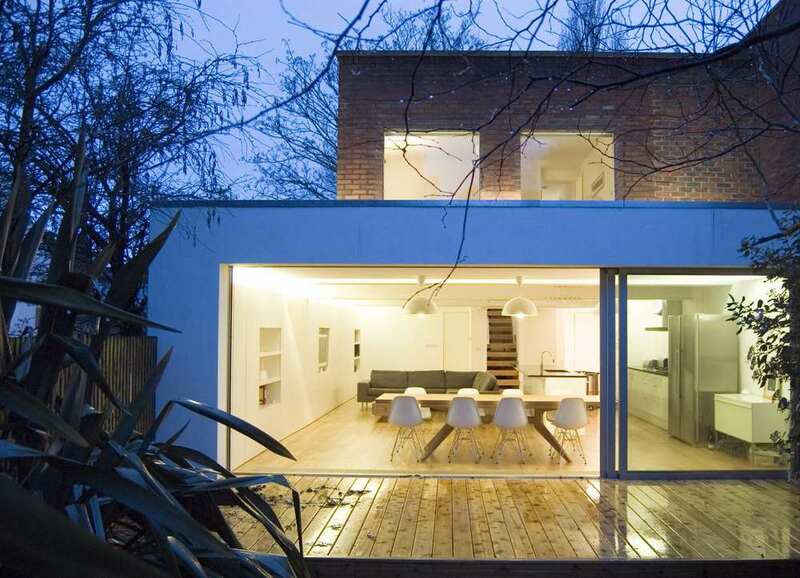 Interpolation House is a two-story brick house in north London. The project draws upon both a catalogue of building parts designed and built in the course of numerous house extension projects, and the vocabulary of our Extrapolation House new-build house design. The exterior form of the building is composed of interlocking, rectilinear volumes of brick, render and timber—and window openings presented as frameless voids in this composition. The ground floor is arranged as a single open-plan space divided by a number of white rectilinear planes and volumes that loosely divide the space into zones, and allow the complete separation of a study and utility room. The bedrooms and bathrooms to the upper floor feature timber-slatted ventilation panels. A new top-lit double-height space encloses an open riser staircase and brings natural light into the deep-plan areas of both the ground and first floors.